My understanding of the AoE circles was that the 2nd yellow circle of an AoE isn't supposed to affect friendly units. I've seen a tip popup to this affect a few times. However, with the Pernicious Cloud ability, allied targets entirely in the yellow circle are still affected. 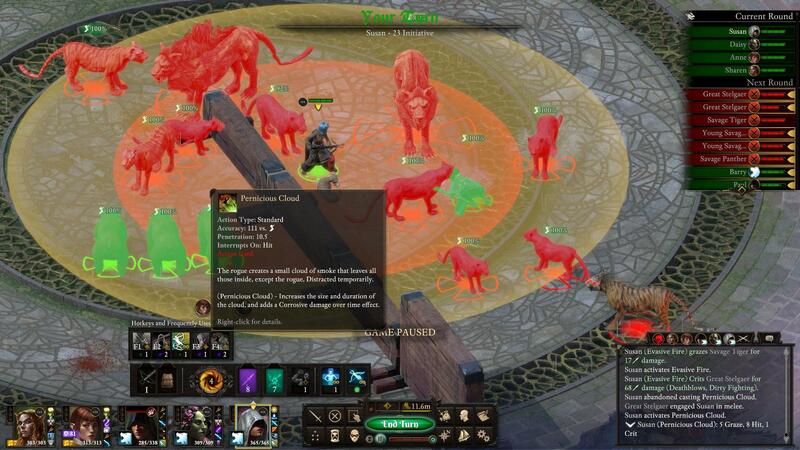 In the image below, every enemy and ally of the caster is hit by the cloud, and suffers the debuff, including the bear on the far-left who is clearly outside of the circle. The caster wasn't suffering any intellect affliction. Edited by error3, 18 March 2019 - 04:43 PM. pernicious cloud, smoke cloud, and smoke grenade have this extremely unique targeting mechanism which is totally and utterly party-unfriendly, with the sole exception that the rogue him/herself is excluded from the targeting. this targeting rule is extremely absolute: if the rogue is confused, they still won't be able to affect themselves (though obviously it doesn't change affecting party members). Edited by thelee, 18 March 2019 - 10:10 PM.